The word ‘Government’ has virtually been a taboo subject within local cloud computing circles for the past decade, with most agreeing the public sector was too security-conscious to consider hosting data in what it has traditionally seen as risky environments. But all that may be about to change. This afternoon, the Australian Government Information Management Office released a key consultation paper outlining a new approach to the cloud computing phenomenon across the Federal Government. The group — which houses Federal chief information officer Ann Steward — is the peak IT strategy group and aids in setting IT policy across the Canberran public sector. In a statement on the group’s blog, first assistant secretary Glenn Archer recognised the growing attention which is being paid to cloud computing. “Cloud computing is a growing area of interest in ICT, and we’ve worked together with other agencies to prepare a draft paper on the Australian Government’s possible use of cloud computing,” he wrote. The paper details that fact that a number of core Federal Government agencies are already using different types of cloud services. 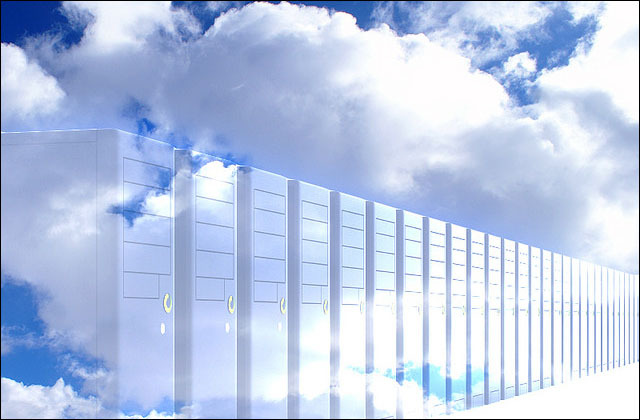 For example, the Australian Bureau of Statistics has implemented virtualisation software to transition to a private cloud environment. The Australian Taxation Office — where much of the Federal Government’s IT spend is concentrated — likewise uses cloud services in its eTax, Electronic Lodgement and Tax Agent Board systems. The Treasury’s Standard Business Reporting platform — a key cross-agency initiative — and Business Names project both use private or ‘community’ cloud capabilities, and the Department of Immigration and Citizenship has implemented a cloud computing proof of concept to investigate providing an end-to-end online client lodgement process on a cloud platform. In addition, the document notes the newly integrated Department of Human Services — which includes mega-agency Centrelink — has a software as a service, or public cloud project at a proof of concept stage. And a wide range of other public sector entities — such as the West Australian Department of Treasury and Finance, WA Health and the Australian Maritime Safety Authority are all testing or using private or public cloud solutions — in the Maritime Authority’s case, Salesforce.com’s Force.com platform. Other jurisdictions such as the UK, Canada, the US and Singapore are also investigating cloud initiatives. The model calls for a tactical approach to cloud adoption. For example, AGIMO believes that services providing public information — such as government websites and portals, could be shifted into a public cloud model within the next two years. For most other services, however, the agency believes that other types of cloud deployment approaches — such as private cloud, or shared private cloud (also called community or government cloud) — could be appropriately investigated over the next five years, with public cloud investigation to come in the three to five year period. An exception was data concerning individual citizens that would be covered by private laws — which AGIMO believes should be only considered for public cloud migration in the 6 to 10-year timeframe, when cloud services have matured further. This type of ‘granularity’ around which type of data and services can be moved into the cloud represents somewhat of a departure for a government agency from previous discussion around the cloud, which has tended to focus on broad security risks, rather than the potential risks of moving certain types or subsets of data into the cloud. And AGIMO has also outlined further steps which will accelerate cloud adoption. For example, the agency is interested in establishing a whole of government public cloud service provider panel, and is planning to migrate its own public-facing websites to the public cloud by March 2011, to analyse the viability of establishing such a panel. It is also planning to integrate the concept of ‘private’ or ‘community’ clouds into the Federal Government’s overarching datacentre strategy. With AGIMO taking responses to its cloud paper until the end of the month, the agency’s cloud statement represents an evolving strategy — similar to the rapidly developing cloud landscape itself. But it will likely be seen as a watershed document by vendors like Google, Microsoft and more — who have struggled to get traction with cloud services in the public sector, despite rapid adoption by private enterprise. I’m not sure clouds have been discussed for a decade anywhere. That is awesome! Cloud computing can cut computing costs by 30% in many cases. This is a tremendous opportunity for governments in many countries. The Aussies are taking the right approach in first deploying public-facing government web sites in a cloud environment. The cost savings will help a lot. Eventually, when they figure out secure protocols, processes, governance, and liability for hosting data in the cloud , more and more applications can move to a cloud environment. Good luck Aussies. I hope that my governments (www.ottawa.ca, http://www.ontario.ca/, and http://www.gc.ca/home.html) do this too.